There is so much going on at Reaseheath outside lesson time! With so many clubs, societies and forums that you can join, and a lively programme of social events arranged by the Student Association, there is plenty to do in your free time. Our student social area, The Jim Humphreys Centre (the bar) in the heart of the campus, has a pool table, darts, table tennis and large screen TVs and is a great place to relax and meet with friends. A lively programme of social events is regularly and enthusiastically arranged by the Student Association, including the Thursday night social (with live DJ) and live entertainments such as hypnotists, bands, magicians and comedians. 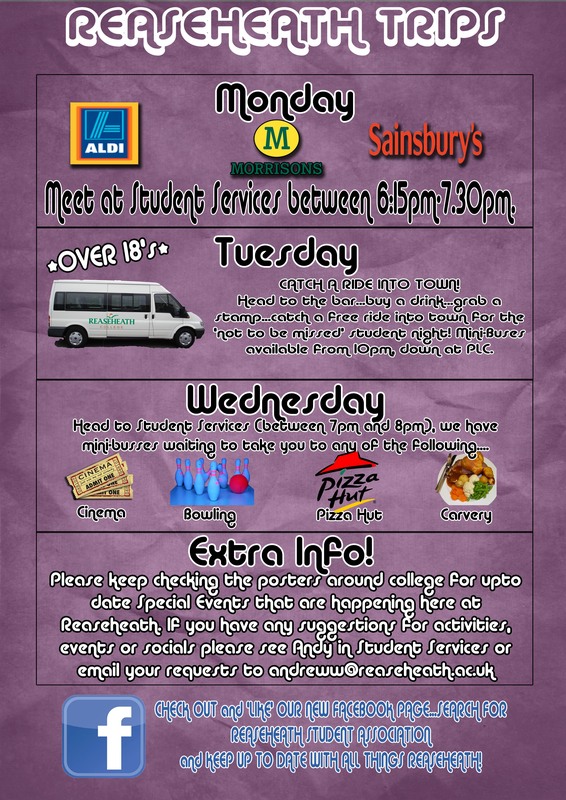 The ‘Reaseheath Experience’ starts from the moment you start your course or move into our halls of residence, with the freshers crew (around 18 returning year students) welcoming you to the campus and being there for you over two weeks of events to get you settled into campus life. Events such as bush tucker trials, slip and slide and freshers ball etc. Last year even saw Wagner from the X-factor!! The freshers crew then go into their Student Assocation roles for the rest of the year. As a Reaseheath student you will automatically be a member of the Student Association. The Student Association provides the focal point for student representation, information, advice, entertainment and services, and ensures your introduction to student life is as enjoyable as possible. One of the highlights of the year is RAG Week. Each year a substantial amount of money is raised for a local charity of the student’s choice. To date, the appeals have raised over £200,000 for worthy local causes, and we need your help to raise that figure much higher during 2015/16. Wednesday afternoons are dedicated to sports activities. You can choose from a wide range of sporting activities – you could join our hockey, football, rugby or netball teams and even compete in the North West British College Sports (BCS) Leagues. We now offer the Gold Duke of Edinburgh Award at Reaseheath, this is a great way to try out new activities and a fantastic way to get involved with new activities whilst gaining a highly valued award. At the end of the year you will be able to celebrate your success with friends and family at our Presentation of Awards Ceremony. Not before letting your hair down at our annual student Summer Ball which has seen live acts such as MTV club and Scott Mills from Radio 1! If you’d like to read more about student life at Reaseheath take a look at our student magazine, Coverage. The Reaseheath Student Association works alongside Student Services to organise a range of exciting social activities on-site including the popular Thursday Social, karaoke and live bands as well as exciting off -site activities such as bowling, go-karting and cinema visits. The Student Association is made up of current HE and FE students from different courses. There are a number of roles within the SA including President, RAG Chair, College and Academic Board Reps, Health and Safety Reps and more. The SA are there to represent all students across the college and act as the Learner Voice from both an academic and enrichment perspective. The SA listen to, and support, all students ensuring that they have a positive and enjoyable experience whilst at the college, whilst aiming to lead the development of all things student led at Reaseheath. If you’d like to get involved with the Reaseheath Student Association go along to one of their weekly meetings on Thursdays at 1.00pm in the Bield Bar. In the meantime to find out what’s coming up follow Reaseheath Student Association on Facebook or like @Reaseheath_SA on Twitter. Reaseheath College are registered with the National Union of Students to enable you to buy an NUS Extra Card. This will enable you to get reductions on your shopping both on the high street and online, in places that will not accept your Reaseheath College ID card as proof that you are a student. You are able to purchase your card once you have enrolled at Reaseheath, by visiting the NUS website or picking up an application form from Student Services. Each year our students select a local charity to raise funds for throughout the academic year. A highlight of the student calendar is RAG (Raising and Giving) Week. Our students raise lots of money for charity through raft races, socials, town centre collections, helping at community events and much, much more! RAG Week has formed a large focal point of the academic year for Reaseheath students since 1987. To date, the appeals have raised over £250,000 for worthy local causes, and we need your help to raise that figure much higher during this year. Our highest achievement was during the 2015/2016 academic year, raising £26,361 for the British Heart Foundation. If you’d like to volunteer to help and get involved in some fundraising events contact any member of the Student Association Executive Committee, who will let you know where to be and when! This academic year we are delighted to be supporting Diabetes UK. Diabetes UK; the leading charity for people living with diabetes in the UK. Their vision is a world where diabetes can do no harm. Their wide range of products and services are designed to help you manage your diabetes, whatever support you need. Whether you’re looking for insurance, information, local support groups or just someone to talk to – they’re here to help. All students automatically become members of the Reaseheath Club once starting at college. The Club provides facilities for the development of social and sporting activities for its members and to further staff/student relationships. The Reaseheath Club operate a licensed bar in the Jim Humphreys Centre. The Bar may also open on Wednesday afternoons following sports fixtures. The college lounge and bar is the centre for student social activities where pool tables, table tennis and a large screen TV are all available. Thursday – our ever popular TNT (Thursday Night Theme). It’s the most explosive night of the week, with a DJ always there! With everything Reaseheath and the Student Association do, it is up to YOU! If you’re interested in attending any of the above please sign up in Student Services. Find out more here. One of the highlights of the student’s calendar is RAG Week. Each year a substantial amount of money is raised for a local charity of the student’s choice. Needless to say, one of the challenges is to raise more money than the previous year’s students! You could find yourself taking part in a raft race on the lake or getting up on stage in a talent show, organising a fashion spectacular or a three-legged race, and of course, dressing up for charity collections in the local town of Nantwich! RAG week is an opportunity for students to let their hair down and have a thoroughly enjoyable week, at the same time raising money for individuals less fortunate than ourselves. Please give RAG Week your support. Finally the highlight of the year, the Student Assocation bring you the Summer Ball. The 2015/16 academic year Summer Ball saw Scott Mills from BBC Radio 1, The Dixon Brothers and Chris Peers. Along with fairground rides and much more, the evening provided students with an amazing, lasting experience of Reaseheath College. There was also a Summer Ball meal supported by magician Luca Gallone from Britain’s Got Talent. Keep an eye out on social media for details about the 16/17 Summer Ball! Reaseheath College has a number of sports teams that compete in the North West Association of College Sport (AoC Sport) Leagues as well as recreational teams who compete against other Land based colleges in the Northern Counties league as well as local universities and sports teams. The men’s football team compete in the North West Category 3B league and play fixtures on a regular basis as well as entering cup competitions across the region. Weekly training sessions take place on Monday 10am-12noon and Friday 9-11am and are run by qualified football coaches from Crewe Alex Football Club. Training focuses not only on skill but developing the fitness of the students as well as their all-round knowledge of the game. The women’s football team represent the college in the North West Category 3B 7–a- side league and play fixtures on a regular basis as well as entering cup competitions across the region. Weekly training sessions take place on a Monday 10am-12noon and Friday 9-11am and are run by qualified Crewe Alex Ladies football coaches. Their home matches take place at the Crewe Alexandra training facilities that are adjacent to the college. The recreational football team is for any residential student and also for those students over the age of 18 and they have the opportunity to train with the academy football teams as well as having training on a Monday evening from 5-6pm which is led by a fully qualified coach. The team play against other land based colleges as well as other local colleges, universities and teams. In the 2014/15 season the team won the Northern Counties league. The rugby team train on a Tuesday evening from 5-6pm on our 3G pitch and these sessions are led by Crewe and Nantwich Rugby Club’s first team coach. The team play against other local college’s and teams as well as playing in national cup competitions. In the 2014/15 season the team won the Northern Counties league. The netball team competes in the Northern Counties league against other land based colleges as well as friendly matches against local clubs, colleges and universities. Training takes place on a Monday evening from 7-8pm and are led by a fully qualified coach. The trampolining squad was formed in 2015-16 and they train twice a week during college time and are led by a fully qualified coach. The squad competes at regional tournaments with two students qualifying to represent team North West at the 2016 AoC Sport National Championships with one member being crowned national champion. As well as entering into competitive leagues the college also offers recreational sports throughout the year and other opportunities to participate in sport. Sports on offer range from Climbing and Badminton to Yoga and hockey and these are offered during and after college. Click the link to take a look at what recreational sports are currently taking place at lunch time and in the evening. 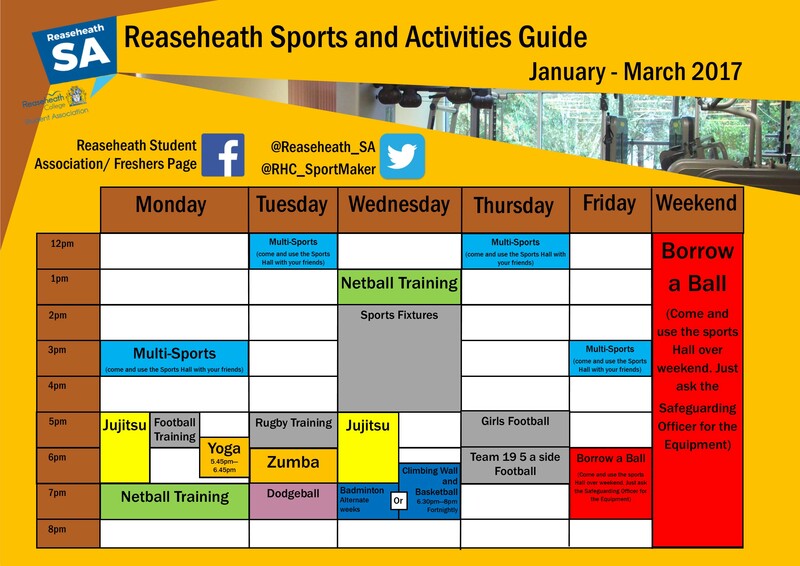 Our College Sports Maker is on hand to help and offer the opportunity to try new sports so if you have any questions about sport at Reaseheath please email sarahr@reaseheath.ac.uk. We have lots of clubs, societies and forums that you can join. From ornithology to photography, canines to conservation – there’s something to suit most interests, or you could always form your own! Each year graduates from University Centre Reaseheath celebrate gaining their degrees at a high profile ceremony in the centre of Nantwich. The ceremony, held in St Mary’s Church, Nantwich, celebrates the success of graduates who have successfully completed their degree validated by Harper Adams University. Undergraduates on University of Chester programmes graduate at Chester Cathedral in November. In September 2018 the guest of honour was award winning garden designer and TV and radio presenter Chris Beardshaw, who handed over the awards. Describing his job as the ‘“best in the world”, newly appointed Principal and CEO Marcus Clinton told a packed audience that Reaseheath’s specialist technical qualifications gave graduates the transferable skills and competitive edge to succeed. It might be your time to move on to pastures new, but that doesn’t mean you have to lose touch with us. We’d love to hear about how you’re getting on, and perhaps invite you back to share a story or two about the great things you’ll do after leaving Reaseheath. Stay connected to the College by joining our alumni network.